There is a strong correlation between engagement levels and achievement levels. For every 2% that disengagement rises, test scores drop 1% (Valentine & Collins, 2011). In a survey of 81,000 U.S. high school students, fewer than 2% of respondents said that they were never bored in school and 75% of respondents said that they were bored because the material being taught wasn’t interesting (Yazzie-Mintz, 2007). Another study (Pianta, Belsky, Houts, & Morrison, 2007) found that 5th graders spent 91% of their day working alone or listening to the teacher talk, despite students’ overwhelming preference for group activities. Knowing that engagement is correlated with achievement, schools and teachers are taking note of this research and implementing plans to increase student engagement. 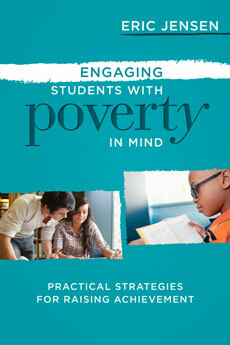 Jensen offers a wide array of strategies and approaches particularly suited to classrooms that serve students in poverty, which are built on an understanding of how poverty impacts the brain and learning. One powerful recommendation he makes to teachers is to manage students’ “mind-body states.” He notes that young students (and even teens) have limited control over their own physical, emotional, and cognitive states. Their sensations (hunger, tiredness, itchiness), emotions (anger, sadness, joy), and attitudes and beliefs (anxiety, hopefulness, focus, optimism) must thus be “managed” by the teacher through specific strategies. So, when teachers notice that students have entered class in an undesirable state, or have reverted to a “default” state that is not conducive to learning, they must ask themselves, “What can I do to change this student’s state from ____ to ____?” and act accordingly. Jensen also encourages teachers to use music and movement to alter students’ states. An up-beat song with inspiring lyrics can move a student from apathy to excitement in less than 1 minute. Synchronized movements, like cheers or dance moves, can help students go from sleepy and isolated to alert and connected in a few moments. Taking a minute or two to put students in the ideal state for learning is the best way to save time in the long run. Next postWhat does engagement look like? Thank you for the interesting points mentioned above. Please allow me to share a classroom moment. Today was one of those days. After 30 minutes of what felt like pulling teeth… I broke routine. It was obvious because I stopped speaking. The students looked up and I sort of looked at them trying to figure out where I had gone wrong. With a smile I said, “It’s like pulling teeth, ya know, waiting, pushing, pulling, begging for responses.” The room was quite, everyone’s eyes glued to mine. I guess they thought I would be upset, certainly felt like it after 3 days of ‘turkey brain.’ I mentioned to them that before Thanksgiving break, “you guys were on fire.” This arena was filled with winners.” (Yes, Hunger Games reference, I love it!) All ears perked up, their eyes lit up because they understood what I was trying to say. “We know,” said another student in obvious annoyance to his blurt! The moments that followed were different than before especially because I gave my students more control. Instead of solving the problems as prompted in the book, I took the same problems and turned them into ONE open-ended scenario that used the same facts and skills needed. You and I know that this can be bit of a challenge, especially on the spot. This new attempt showed more flexibility and choice, by allowing them to decide the best solutions for the problem. Also, by allowing the students to teach the class and share their thoughts to the word problem/expression/scenario, they had ownership over their work. In the end we tackled 1 problem instead of 6, but I know that they gather more in those moments, as a team, because we were engaged.